Step inside this amazing little museum’s big collection, and discover some of the unique pieces hidden inside. See how the museum got its start, and how it’s preparing for the future. Julia Kim, Kathee Michalski and Gloria Snopko pause before each painting – commenting, pointing, stepping back or sideways for a different perspective. These three members of the Wayne Art League of Batavia, Ill., are visiting the Freeport Art Musuem (FAM), to view the 144th traveling exhibition of paintings from the American Watercolor Society’s annual juried show. The Society, founded in New York City in 1866, each year picks only six venues across the country to host its exhibition, which is open to artists from around the world; this is the fourth time FAM has been chosen. “This is an amazing museum for a town this size,” Kim comments. “We’ll definitely be back,” Snopko concludes. Before leaving, the ladies ask for recommendations from the staff on places in Freeport to stop for lunch. On this particular day, members of the Monroe (Wis.) Arts Center are also viewing the watercolor exhibit, which was on display at FAM March 3-May 19. Surprisingly, the relative anonymity of this rich community resource isn’t limited to outsiders; many Freeport residents also seem to be unaware of the museum and its contents and programs. But Kirker Priest, her small staff and FAM’s dedicated board are working hard to change that, from renovating galleries and changing exhibits more often, to expanding PR and outreach programs. FAM was established in 1976, the result of an acquisition from the estate of W.T. Rawleigh, founder of a successful international household and medical products company in Freeport. Rawleigh came to Freeport in 1889, and began selling “Good Health Products” by horse and rented buggy. By his third year, he had several rigs selling his spices, herbs and medicines, and a stop from “the Rawleigh man” was a highly anticipated event. He established his Freeport factory in 1904, and the company went international in 1912. The entrepreneur also invested in bettering his community, from philanthropic endeavors to public service; he served as mayor of Freeport, and in 1924 was even considered as a vice presidential candidate by the Progressive Party. Rawleigh, who died in 1951, used his substantial wealth to acquire fabulous works of art from around the globe for his private collection; in 1976, a sizable portion of the collection was given to the residents of Freeport, and to house it, what is now FAM was created. Among the Rawleigh collection: early Pueblo pottery from the American southwest; large European paintings (mostly 19th century); European bronze and marble sculptures from the 17th and 19th centuries; and from Florence, one of the world’s most extensive collections of pietra dura – translated from the Italian as “hard stone” – a mosaic art form. Created to be inlaid decorative elements in furniture, pietra dura appear to be painted landscapes or portraits, but are actually created entirely from hand cut, highly polished agate, alabaster, onyx, lapis lazuli, amethyst, jade and other precious colored stones. Over the years, other benefactors have added to FAM holdings, including a Near & Far East Collection; the Egyptian Collection, which includes a child-sized mummy case and mummified animals; artifacts from Papua New Guinea and Africa; a Native American collection, not only from North but also Central and South America; a contemporary gallery; and more. A recent acquisition is an impressive collection of textiles. Today, FAM has more than 4,000 pieces in its permanent collection. On the main floor are two galleries used for FAM’s special exhibits, along with three more that display pieces from FAM’s permanent collection. The new informative graphics are meant to encourage longer stops by visitors in each gallery. Changing out the pieces on display more often is a way to motivate repeat visits as well as showcase more of FAM’s extensive collection. Another incentive for repeat visits is FAM’s Mystery Object of the Month, which is also another way for visitors to become more involved in the collections. On the second floor is the African and Oceanic Gallery, the student gallery, which showcases art created by local students, and FAM’s Contemporary Gallery. “We’ve pulled some of our watercolors from our permanent collection to compliment the one downstairs,” says Kirker Priest. 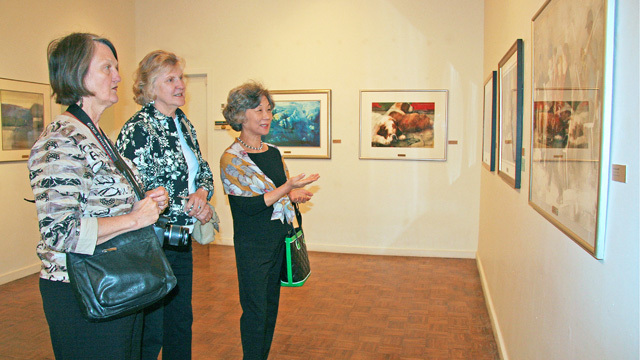 Art and museum education are central to Freeport Art Museum’s role in the community. Outreach programs include family and school workshops, along with every 4th and 6th grader through FAM during the school year. FAM also hosts adult art classes, and strives to bring in temporary exhibitions to attract a wider audience. FAM has a dedicated Board of Directors and many individuals who support its programs and collections. The board recently raised funds to rehab the storage area for FAM’s collection and install professional, museum-quality exhibit cabinets for the pieces not on display. Of course, that meant everything had to be moved out and then brought back in – more than a weekend project. Danelle Setterstrom is an art teacher at Freeport High School, and director of the local Empty Bowls program. Empty Bowls raises awareness of and funds to battle hunger, by soliciting local artists to donate handcrafted bowls and local restaurants to donate homemade soups. Visitors buy the bowls during a live auction and then partake of the soup, served up in their newly-purchased bowls. FAM has potential for growth, but the usual challenges faced by a nonprofit organization are amplified in this tough economy. Setterstrom encourages her students to visit FAM on their own, and takes her classes there on field trips whenever possible. 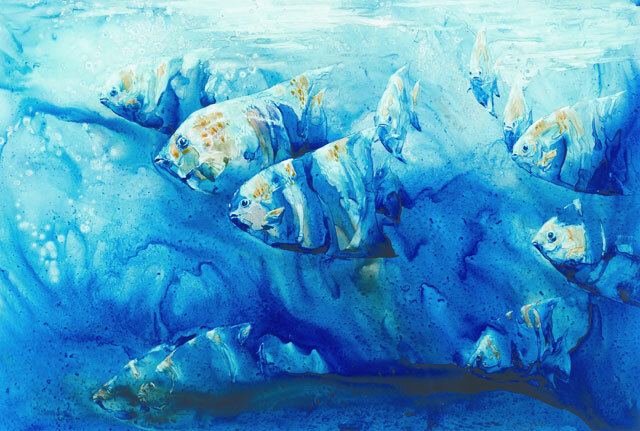 She and her husband take their children to FAM art classes on Saturdays; it was during a Raku pottery demonstration that the couple was inspired to begin making their own pottery, which they now sell. The facility has been gifted a parcel of land in downtown Freeport, and plans for a new building are being contemplated, although no solid plans are even in the works. This entry was posted on Thursday, May 24th, 2012 at 12:00 pm	and is filed under Arts & Entertainment, Top Posts. You can follow any responses to this entry through the RSS 2.0 feed. Both comments and pings are currently closed.